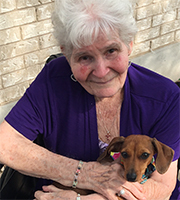 Lois Lucille (Millage) Ambrose Brown, age 91, of Kyle, Texas, passed away Friday, December 8, 2017, at home surrounded by loved ones. She was born on July 29, 1926, in Ridge Farm, Illinois, a daughter of Virgil Millage, Sr. and Edith (Smith) Millage. She was married to Richard Clifton Ambrose who in 1979 preceded her in death. Lois worked in retail most of her life. She loved to travel, watch sports, and spend time with her family. She was a Christian and a member of Hays Hills Baptist Church, Buda, TX. She was preceded in death by her parents, one sister, three brothers and one grandson. She is survived by son, Duane Ambrose and wife Marti of Louisville, IL; son, Dan Ambrose and wife Susan of Lake Suzy, FL; daughter, Diane Collins of Kyle; son, John Ambrose and wife Rhonda of Buda; and daughter, Debbie Miller and husband Keith of Kyle. Ten grandchildren: Kim Bourgeois (Fred), Mark Ambrose (Tona), Matt Ambrose (Jackquie), Josh Allen, Lindsay Allen, Denny Collins, Caleb Ambrose, Kelsey Ambrose, Jackie Truitt, and Anthony Truitt (Caryn); eight great grandchildren: Joel, Hailey, Trevor, Zack, Ellerie, Isaac, Tessa and Paxton; one great-great grandchild: Colton. She is also survived by sisters, Margaret McCoy of Sun City, AZ, and Marlene Collins of Flower Mound, TX, and brother, Virgil Millage, Jr. of Champaign, IL. Visitation was Tuesday, December 12, 2017 with a memorial service that followed at Harrell Funeral Home of Kyle, TX. Interment was held on December 12 at Memory Lawn Memorial of San Marcos, Texas. Memorials may be given to Hays Hills Baptist Church Lottie Moon Missions Fund at hayshills.com.